Investment Idea: $100 invested in a US government Series EE Savings Bond. Extra Costs: $.44 (One forever stamp) and one envelope, to mail in a form. Total Time Spent on Investment: 15 minutes signing up for a Treasury Direct account. 15 minutes spent at a bank getting a bank seal. 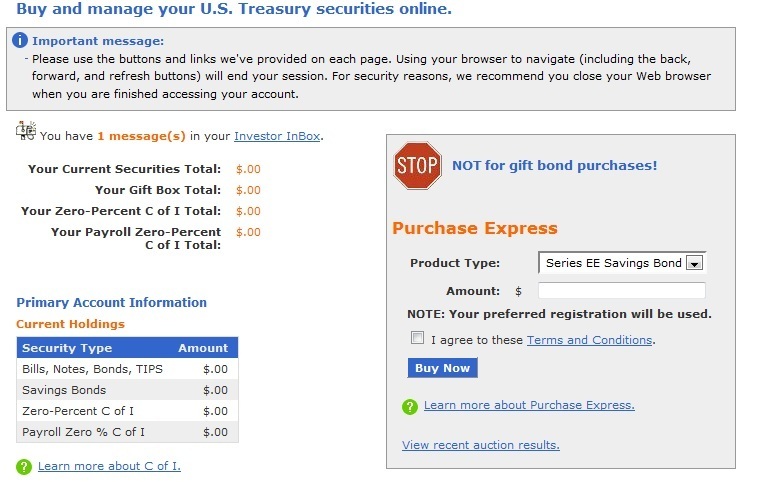 10 minutes spent finishing up signing up for the Treasury Direct Account and buying the Series EE Bond. The world of investing in bonds is a little bit tricky and it is hard to find easy to understand financial information on how and where to buy them. I normally refer to InvestingEd.com when I need financial help, but for this investment and my other bond investments to follow I needed to find a better source. After Googling around for terms like “Bonds,” and “how to invest in bonds” I found an interesting piece via Reuters.com on a petition to restore old-fashioned paper U.S. bonds. The petition was being led by Marc Prosser, founder of LearnBonds.com. Marc’s biggest pet peeve was the fact of how the simple and lowly US Savings bond had served as an introduction as an idea to saving money and earning interest for many millions of Americans including himself. By doing away with the physical nature of them, millions more kids would never grow up with the joy of learning about investments at such a young age. A real shame. I really liked what Marc had to say so I checked out LearnBonds.com and was rewarded with a massive amount of information on any possible questions you could have on investing in bonds. After reading a couple of articles I decided to email Marc directly and ask him some more in-depth and specific questions on bonds, and recommendations he might have for me. Marc quickly replied and was happy to talk to me so we set up some phone time and chatted away. Marc’s background had been in ForEx trading, but after noticing a giant number of ForEx websites and very few bond informational sites he got together with his business partner and founded LearnBonds. I wanted to learn from Marc what were the best bond investments and what he recommended most. Of course his first statement was definitely don’t invest in bonds for one year. Also, an investment of just $100 was somewhat of a handicap. However using TreasuryDirect, anyone can buy Treasury Bonds for as little as $25. For the short term the better option is clearly the I Bond, which currently has a set rate of 2.2%. In the long run the EE Savings Bond could be the better option, since it comes with a guarantee that it will double in value over the course of its lifetime. This means that even though its federally set rate is .60% currently, over the next twenty years it should still manage to double in value giving it a real rate of return of closer to 3.0% over the lifetime of the bond, which is higher than the current rate of 2.2% that I Bonds come with. So in my case $100 invested in Series EE Savings bonds should give me a return of .60% for the current year, which is worse than my CD earning 1.02%. But the series EE’s guarantee that it doubles in value means twenty years from now that same savings bond should be worth $200, giving me a 100% return, whereas on the CD there is no guarantee that it will earn anywhere near that over the course of it’s life. So I opened a TreasuryDirect account which you can read about here. This process was a little annoying and took two weeks, but once the account was opened the funding process was a quick and easy bank transfer, and before I knew it I had bought my first Series EE Savings Bond. When investing you should always have as diverse a portfolio as possible. You should have some risky investments, as well as some safe investments, and then you should have some investments that return so little and are considered so safe you don’t even know if it should be called an investment. A Series EE Bond is one of those investments. In general, Marc recommended bonds for people who aren’t rich but at the same time don’t need money right away. So really any one who is in the middle. When I asked Marc what had been his best investment in his life he told me it would have actually been one of the paper savings bonds he had received as a kid which had a face value of $50 but had paid out over $350 over the years. I guess he has a really big reason for wanting to bring back those same paper bonds all these years later. I hope my investment in Series EE Bonds does as well for me as it did for Marc. Series EE Bonds accrue interest at a current rate of .60% a year, which is rather low but also is not taxed. 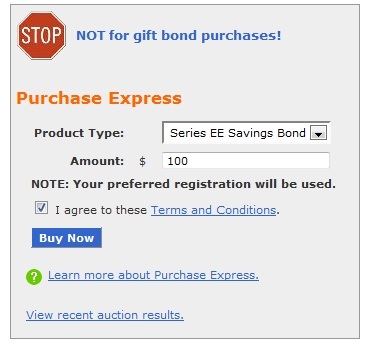 There is a penalty for withdrawing a Series EE Bond early, but when buying them you should really be buying them for the long run (twenty years) so they maximize their return. To find an up to the minute price of my Series EE Bonds and my other investments click here!